Her association with mega-watt superstars including Beyonce, Rihanna and Katy Perry has meant that bipolar, acutely self-conscious and socially anxious singer-songwriter Sia has never been more famous or exposed. A cruel irony or maybe the plan all along? Four years after her last album, “1000 Forms of Fear”, her sixth, with its shrewd marketing campaign and consistently, relentlessly mighty major-key choruses means that every hen party and XY and Z Factor hopeful will require a copy, but there’s always been much more to Sia than straightforward show-boating. Slowly veering towards coffee table Dido-isms over the course of her discography, the late noughties saw Sia Furler kick through the inoffensive AOR that always threatened to dominate, and collaborated with guitar and synth pop super-producer Greg Kurstin on 2010’s “We Are Born”. More Cyndi Lauper than Madonna (although a Madonna cover was included, Furler and Kurstin both displaying their collective pop chops) it was more forthright, raucous and brightly commercial than anything before, and still managed to incorporate the power ballads that she is better known for. It was also the album that pushed Sia into semi-retirement from performing, instead concentrating on writing material for other artists, an endeavour that has proved to be more successful than her own solo career. This sound is both amplified and smoothed out on “1000 Forms of Fear”. “Chandelier” starts off sounding a lot like Rihanna and then it doesn’t sound like Rihanna at all. Once you’ve heard, or experienced, its staggeringly audacious chorus you’re unlikely to forget it and it’s hard to imagine anyone else, let alone Rihanna, sing it. Almost a novelty record, such is its persistent, cartoonish swoops and appropriately high drama; one of the most incredible things about this particular song, one that has already defined and led this era, is how much it is a Sia song and could be only be meant for her. Her vocal eccentricities, and they have always been there but never so pronounced, ensure that this ultimately melancholic song has a clear personality attached to it and could never have been interpreted as effectively by any of its potential owners. “Big Girls Cry” and “Eye of The Needle” are both unsubtle belters that could soundtrack the next Bridget Jones movie and how you feel about this type of sentimental, rom-com ready music generally will determine how much you enjoy them but they are extremely well done here. Apart from the terrifically loping and previously released “Elastic Heart” which is co-produced by Diplo, Furler has again paired up with Kurstin and he is at the helm sonically throughout. Less playful and rambunctious than “We Are Born”, there are still some lovely touches here such as the shredded vocals on the chorus of the manically deranged “Free the Animal” which provides some respite from the reliance on a blared super-hook. The seductive, sawing, “Fair Game” shocks with a sudden, sickly , close-up xylophone solo competing with Sia’s distant moans, and an explosive final third, while “Hostage” gallops along with guitars and a retro Motown energy. “Fire Meet Gasoline”, another power ballad and probably the crudest here, highlights the problem of Sia’s omnipresence within the current pop framework. It is without question a song which could be a big hit, it sounds like a million-selling Sia record but one which is already recorded by someone other than her. It sounds a lot like “Diamonds” or “Pretty Hurts”, r’n’b mid-tempos sung by two of the world’s most popular and famous female singers but it doesn’t sound like a record that Sia would ever sing. The same goes for the over-long, over-wrought and noisy album closer “Dressed in Black”. Compare these to the hissing and crackling psychodrama of “Cellophane” (‘Can’t you see I’m wrapped in cellophane, watch the blood pump through my veins, electricity floods my brain, can’t hide the pain’), a rare exercise in restraint here and one of the album’s best songs and the equally macabre, bell-flecked “Straight for the Knife” and it’s clear that some songs are closer to the singer’s own world and personal experiences than others and these are the most successful within this context. 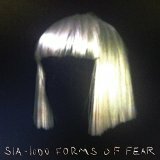 Sia is at the very top of her game with “1000 Forms of Fear”, an album which can admittedly fatigue when played from end to end but when individual songs, or the extremely strong middle section, are played in isolation this is indeed some of the most warming but persistently dark and potent music that Sia has both written and performed. The problem is that we can now clearly see, understand and start to deconstruct her formula, within these twelve songs her technique is laid out bare for all to see. The consistent use of metaphors and building a lyrical theme around them rather than the metaphor fitting the songs’ content (nine out of the twelve titles -- look at them!) and lyrics which are straightforward and defy any kind of confusion or mis-reading, her traditional use of verse-chorus-verse-bridge-chorus writing and key changes which are predictable but wholly satisfactory; there is no deviation from this pattern. Pop’s most reclusive queen may have her back to the audience but she isn’t the reluctant star she proclaims and “1000 Forms of Fear”is her loudest cry for self-recognition so far and will undoubtedly be her must successful. Good thing too as it seems Sia has finally become tired of standing in the shadows.